This is the way the legendary playback singer, actor, producer, director Kishore Kumar Ganguli used to introduce himself in live concerts. 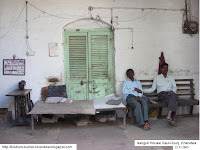 I was very excited on getting the opportunity to visit Khandwa for personal reasons and made determination to spend some time in exploring various places connected some way or other with Kishore. 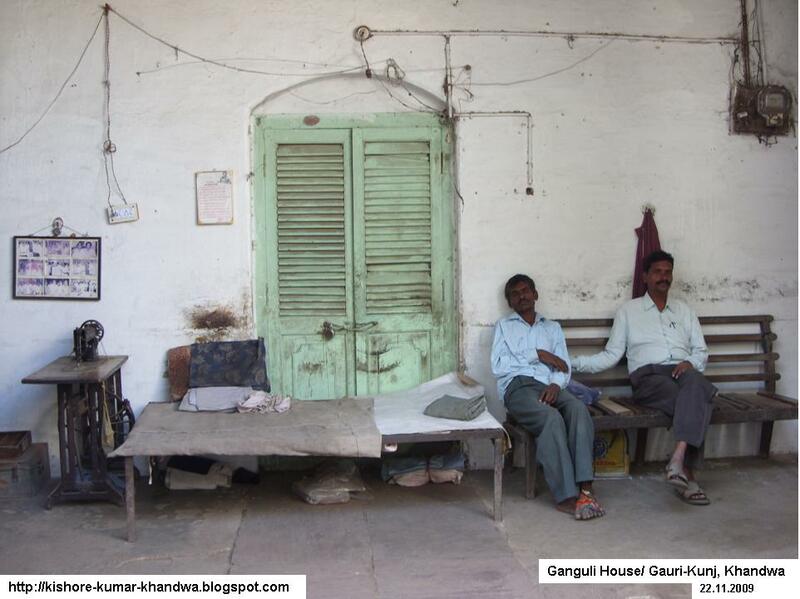 Luckily my elder brother and his wife were in Khandwa the same time and I had the luxury of moving around in their car. 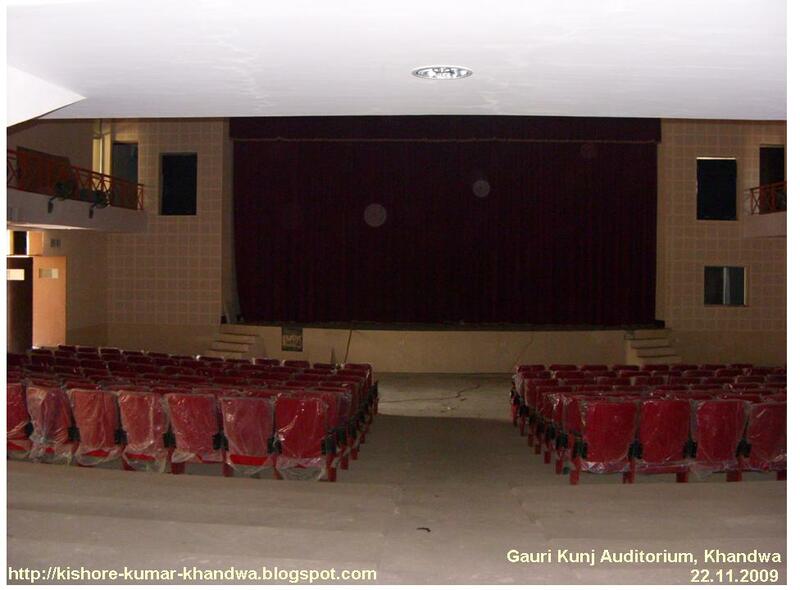 The first place we visited was Gauri-Kunj auditorium located in front of S.N.College. The name Gauri-Kunj combines the name of Kishore’s mother Gauri Devi and father Kunjilal. Now all those enthusiasts who don’t leave any opportunity to say the choicest words against government/administration must read very carefully as to how Gauri-Kunj came into existence. 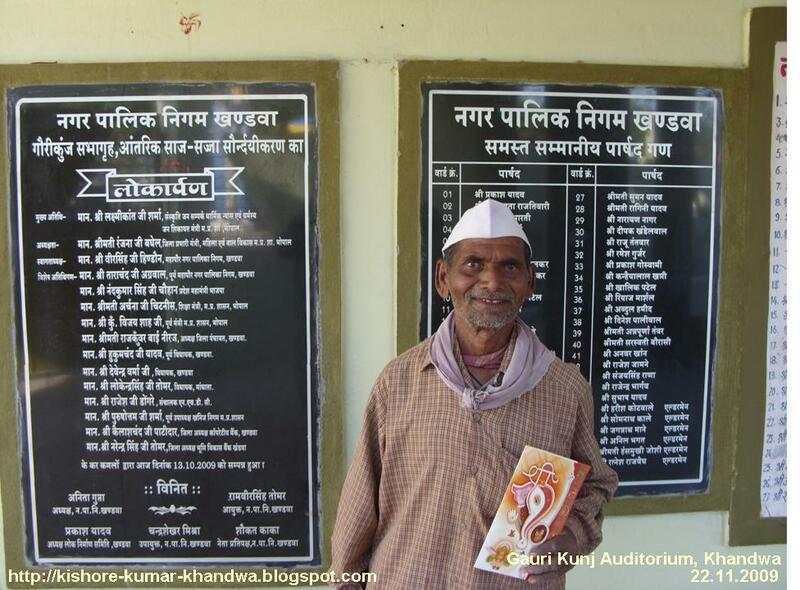 Khandwa in the memory of his parents. The foundation stone was laid by Kishore’s elder brother – the legendary actor Ashok Kumar (a.k.a. Dada Muni in bollywood) on 1 June 1983. However, the site proved to be on disputed land due to which KK could not turn the dream into reality during his lifetime. But after his demise, few enthusiasts, along with the help of state government of Madhya Pradesh left no stone unturned to resolve the matter. 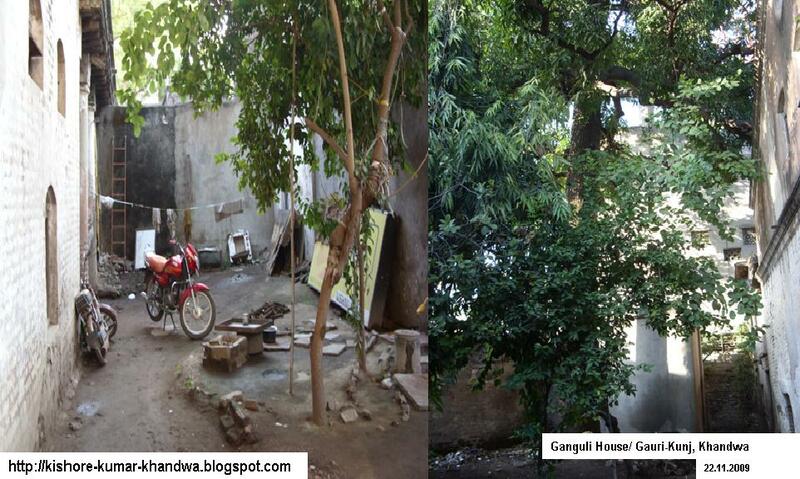 As told by local residents of Khandwa to the blogger, KK’s own sons Amit Kumar, Sumit Kumar did not show much interest. 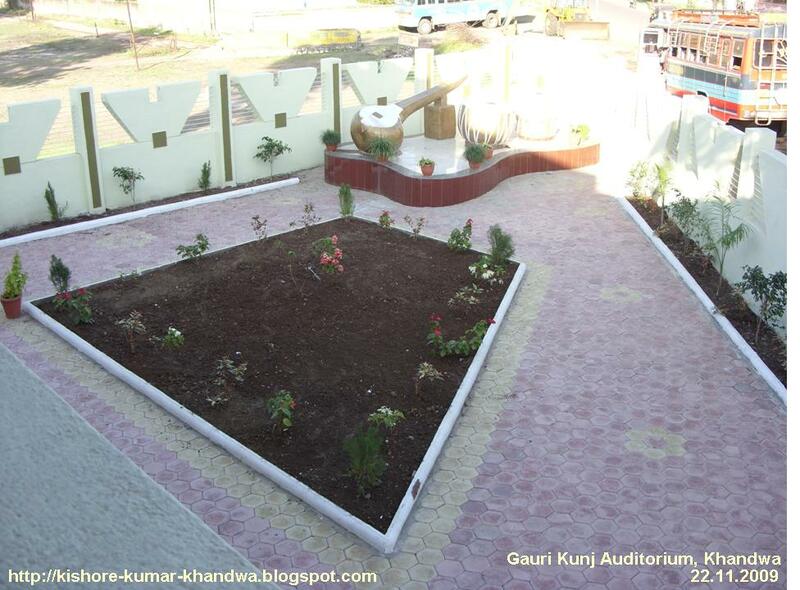 After crossing various hurdles, the auditorium was finally constructed and inaugurated in 1998. And after interior furnishing, it was dedicated for public use on 13.10.2009. 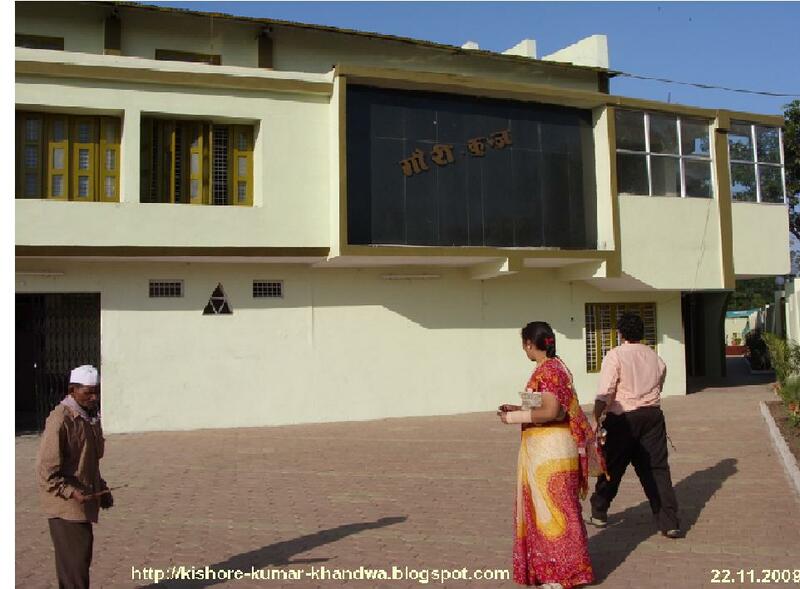 Recently it has been handed over by the trust to municipal corporation. So, while Mumbai simply minted money in his name and hasn’t done anything to keep his memory alive IN MATERIAL FORM, the people of his Janmabhoomi have brought a herculean task to logical conclusion! Nathalal also shared his own agonies – not getting salary for months together, nobody concerned about the remaining patch work to be done here and there in the auditorium. But he is still continuing with the job due to love for Kishore Kumar! 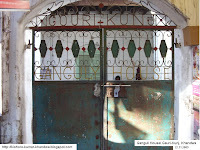 From Gaurikunj auditorium, we moved to Ganguli House (this too is also known as Gauri-Kunj) behind Gandhi Bhawan, a stone’s throw away from the railway station. 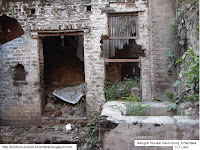 When we reached near the place and asked about the exact location of the house, few shopkeepers in the locality were totally ignorant. Finally one of them asked us to move left, leave two shops to reach the place. What a pity! 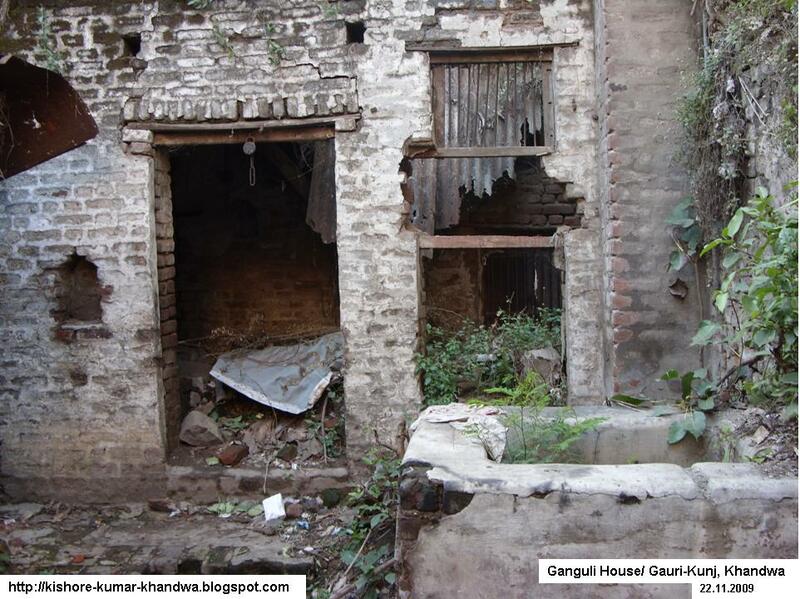 The shopkeepers have rented shops in the front part of Ganguli House and they don’t know about the heritage! On moving inside, our hearts started sinking! The first thing to be viewed in the courtyard was a sewing machine. 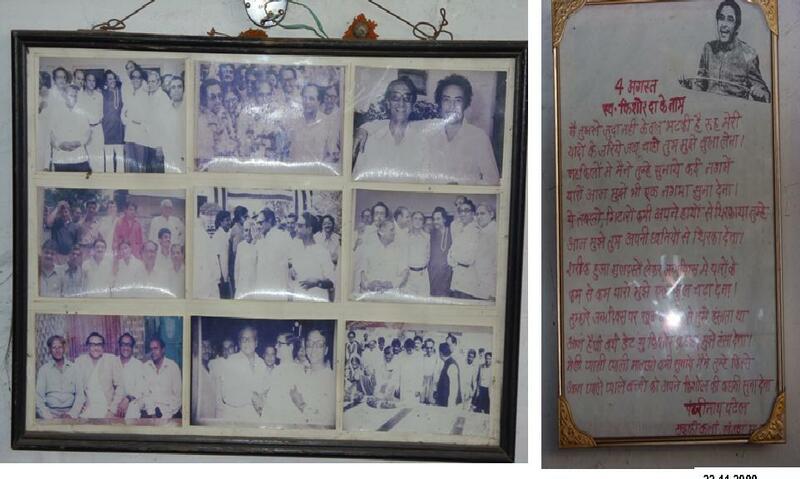 The only bright spot on the otherwise pale walls with peeled off paint and plenty of cobwebs was a photo frame having snaps of KK, Ashok Kumar, Anup Kumar and their friends from Khandwa and a very emotional poem written by one of the die-hard local fans in the memory of Kishore Kumar. On moving further ahead towards open space, a tall tree could be seen which must have grown up with the Gangulis and must have SEEN Kishore yoodling even before he joined film industry! On getting further inside, we were even more agonized. The area on ground floor in front of toilet was in somewhat okay condition but we could not gather courage to climb stairs leading to first floor. The wooden beams eaten by termite are hanging freely and the moment anybody dares to step on first floor, would fall down to the ground floor along with the crumbled structure! 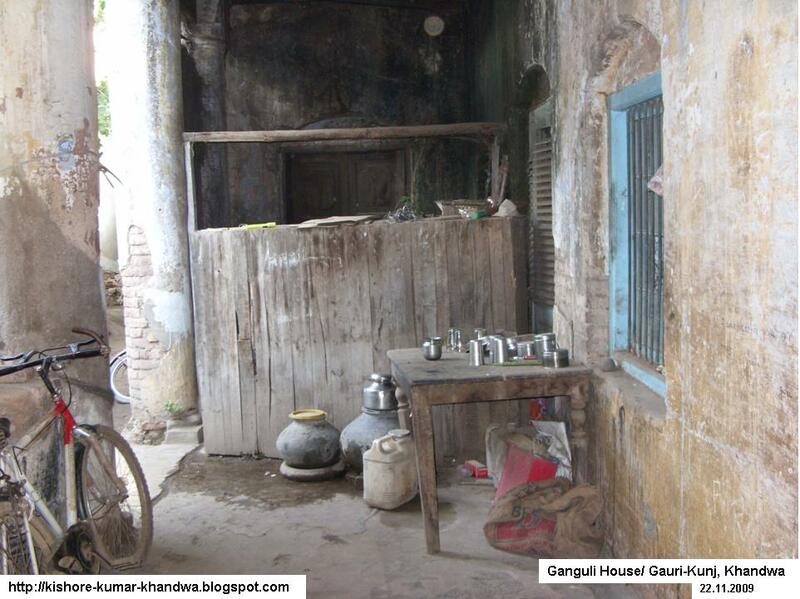 Similar is the condition of kitchen and water storage tank. 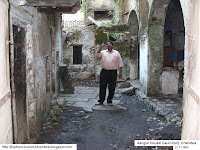 It seemed nobody has tried to restore the condition of the dilapidated building for long time. We just could not bear to see any more and moved out. 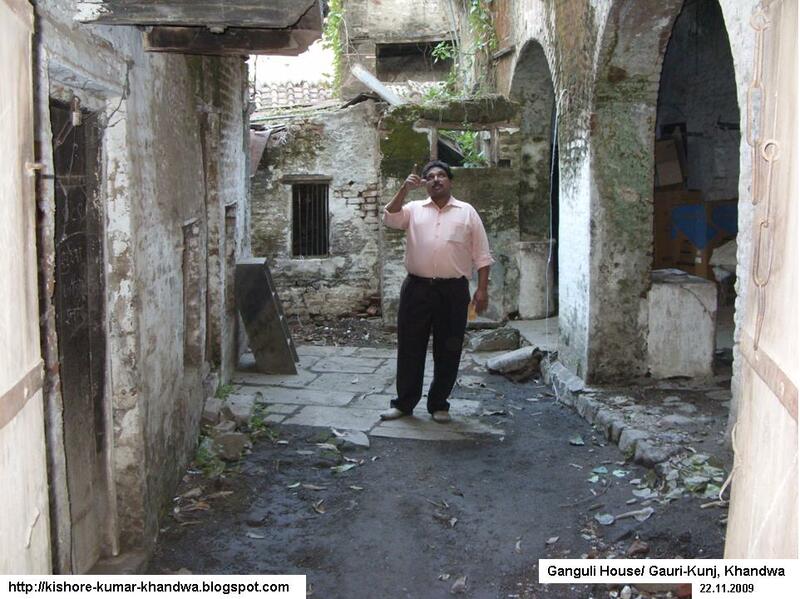 Fortunately, we got to meet the watchman – Shri Sitaram Sharma, who has been guarding the house for last 35 years. Shri Sitaram also mentioned that long back, the house was legally handed over by Ashok-Kishore to their brother Anup Kumar. Presently Anup Kumar’s son is the owner. Some 10 shops have been rented out on the front portion and he only visits annually to pay property tax etc. Unfortunately due to lack of time, we could not visit the Samadhi sthal – the place where Kishore Kumar was cremated besides Indore road. 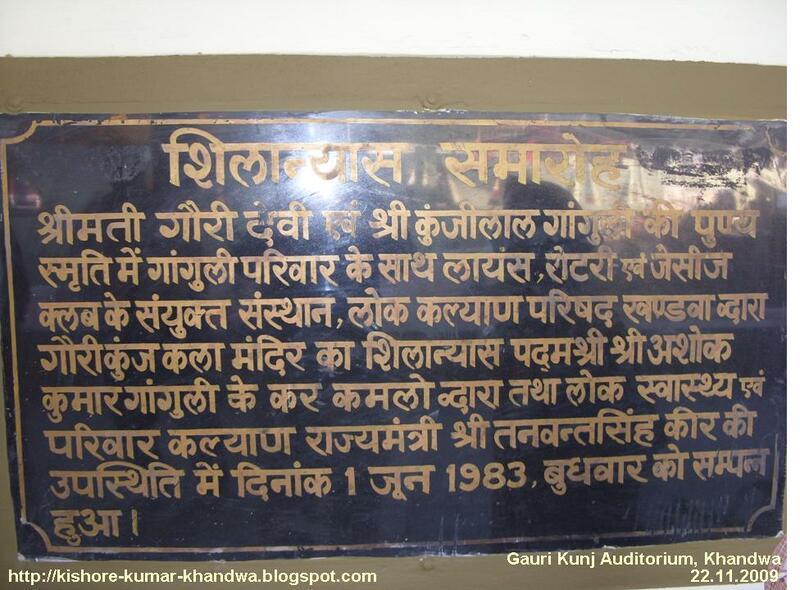 Few people said that an auditorium (Gauri Kunj) also existed at Samadhi sthal while the others categorically said that there was only one auditorium (in front of S.N.College). We left this question unanswered with the hope of visiting again in near future and finding the answer ourselves. I felt it my duty to present the facts before Kishore Kumar crazy fans. We cry too much about the issues not in our control. But this issue is certainly not out of those which cannot be acted upon by the true fans of Kishore Kumar. Can the KK fans not unite to organize resources for restoring such important heritage also connected with the legendary Ashok Kumar & Anup Kumar? Will any fan be moved enough..........!!?? धन्यवाद! आशा है आपका पुनरागमन होगा!